Click the 'About' option in the 'More' Screen to view the 'About' information dialog. 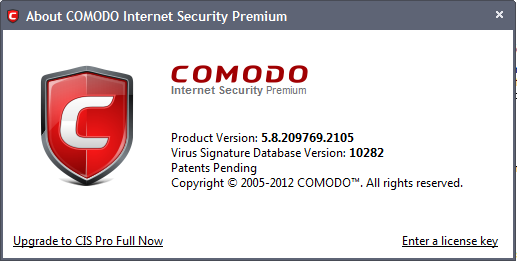 The 'About' dialog displays the copyright information and the information on the version numbers of Comodo Internet Security and the Virus Signature Database installed on your computer If you have installed the Pro or Complete versions, the unique serial number of your installation is also displayed. The serial number is used to identify your installation and is necessary for support purposes. Clicking the 'Upgrade to CIS Pro Full Now' takes you to the Comodo website for the purchase of CIS Pro version, if you have already installed Premium version. 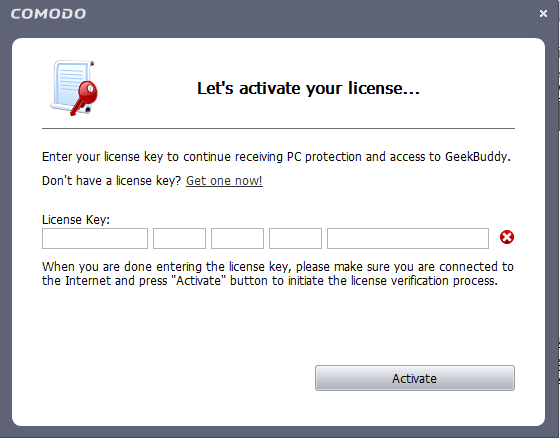 Clicking the 'Enter a license key' link opens a license Activation dialog to activate your subscriptions for CIS Pro or Complete version. Refer to Activating Your License for more details.